Dr. Paul Ralph is a Lecturer in Information Systems at Lancaster University & director of the Lancaster University Design Practices Lab. His work focuses on the empirical study of designers. Dr. Kafui Monu focuses on analysing, & gathering information about, employees’ decision-making processes. His new area of research looks at creating better purposeful games. When considering how to teach fundamental principles of game design, we find ourselves torn between two well-cited frameworks: the Mechanics-Dynamics-Aesthetics Framework (MDA) and the Elemental Tetrad. We want to teach both, because each has its merits, but teaching two separate frameworks is unnecessarily confusing. This essay therefore develops an initial proposal for a working theory of game design by integrating these two existing frameworks. Mechanics describes the particular components of the game, at the level of data representation and algorithms. Dynamics describes the run-time behavior of the mechanics acting on player inputs and each others’ outputs over time. Aesthetics describes the desirable emotional responses evoked in the player, when she interacts with the game system (Hunicke et al. 2004 p. 2). Briefly, game designers manipulate the workings of the game (e.g. rules). Player interactions with game mechanics create dynamics; e.g., offside rules in football, rugby and hockey encourage teams to stay together (herd behavior). These dynamics, in turn, affect the player’s emotional experience or aesthetics (e.g. fellowship). 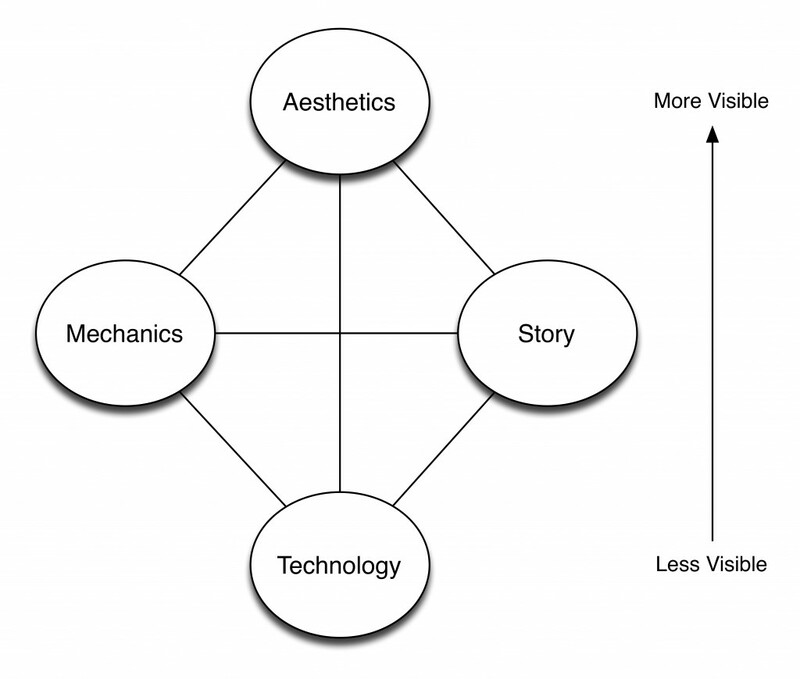 Meanwhile, the Elemental Tetrad (Figure 2) comprises four elements: mechanics, technology, aesthetics and story (Schell 2008). Schell defines mechanics as “the procedures and rules of your game”(p. 41) and discusses six mechanics –“space”, “objects”, “actions”, “rules”, “skill”and “chance”. Space is where the users engage with the game (both virtual worlds and physical space). Objects are tools used by the player to advance in the game. Actions are how the player interacts with objects. Rules govern the game environment. Skills are physical, mental and social abilities used by a player to progress. Chance refers to the randomness and uncertainty that exists in games. Clearly, space, objects, actions, skill and chance are not simply procedures and rules as Schell suggests. Technology refers to the tools and systems used to implement or deliver the gameplay. The same mechanic (e.g. space) may be implemented using many different technologies (e.g. cardboard game board, mobile phone screen, game console). Aesthetics describes “how your game looks, sounds, smells, tastes, and feels”(Schell 2008 p. 42). Table 1 lists some examples of mechanics, dynamics, aesthetics and technology. Notwithstanding some differences in language, the two frameworks broadly agree on the presence of mechanics and aesthetics. Hunicke et al. make a convincing case for including dynamics and Schell makes a convincing case for including technology. It therefore appears reasonable to include all four elements in our working theory. Story, however, is more complicated. Schell (2008) defines story as “the sequence of events that unfolds in your game”(p. 41). Most if not all games may have a story in Schell’s sense of a sequence of events –even the sequence of falling blocks in Tetris would be a story using Schell’s definition. However, story usually denotes “a narrative of real or, more usually, fictitious events, designed for the entertainment of the hearer or reader; a series of traditional or imaginary incidents forming the matter of such a narrative; a tale”(OED 2013). Many games (e.g. checkers, roulette, Cut The Rope) clearly do not have a story in the dictionary sense of a meaningful narrative. 1) Embedded Narratives. The defining feature of an embedded narrative is that it is told to the player by the game’s creators. In the string-of-pearls story method, the player experience oscillates between interactive gameplay and storytelling (Schell 2008). For example, the Mass Effect, Walking Dead, and Call of Duty series use intermittent cut scenes to build narrative. However, cut scenes are only one method of embedding narratives. In BioShock, for instance, much of the narrative is embedded in the artwork and audio dialog during gameplay. Other games, such as Tetris, have little or no embedded narrative. In this view, embedded narratives occupy the same conceptual level as mechanics and technology–they are part of the game whether or not anyone plays it. 2) Emergent Narratives. The defining feature of an emergent narrative is thatit is created by the player(s) using the game. In Borderlands 2, for instance, shooting the helmet off a goliath enemy will cause it to chase and attack whichever friend or foe is nearest, leveling up as it goes. This facilitates an emergent narrative –the player sets off the goliath from afar, the goliath clears out its own base, the goliath chases the player to another enemy base, the goliath defeats the new base and only then does the player take down the goliath. The player experiences this as an interesting sequence of events – an emergent narrative. Other games (e.g. SimCity, Railroad Tycoon, DayZ, Rust) rely entirely on what Schell (2008) calls “the story machine method”; that is, they are designed to produce interesting sequences of events, which may be perceived as stories by players (Schell 2008). While some games strongly encourage emergent narratives, most if not all games may form part of an emergent narrative given a sufficiently creative player. Emergent narratives occupy the same conceptual level as dynamics as both arise from player-game interaction. 3) Interpreted Narratives. When a person reads a book, the narrative they absorb may differ from the narrative that is intended by the author. People visualize environments, interpret characters’actions, speculate about authors’intentions and generally assign meaning to what they read. Sometimes people simply misread words (e.g. read “portend”as “pretend”). Similarly, players may form different interpretations of embedded and emergent narratives. We therefore use interpreted narratives to refer to the player’s mental representation of emergent or embedded narratives. Interpreted narrative occupie the same conceptual level as aesthetics, in that both are primarily in the mind of the player. Armed with our more nuanced conceptualization of game narratives (above), we can now proceed to combine MDA and the Elemental Tetrad (Figure 3). While others (e.g. Millán 2012) have suggested combining these two frameworks, we are not aware of any work that has done so at the level of depth attempted here. We will refer to the result as the Mechanics, Technology, Dynamics, Aesthetics plus Narratives Framework (MTDA+N). Its core concepts are defined in Table 2. Notes: Arrows indicate interactions; rectangles indicate concepts; dashed lines indicate optionality. Embedded Narrative A meaningful sequence of events intentionally embedded in a system by its creators; a plot. Informally, players interact with game mechanics and (possibly) experience embedded narratives through technologies. Dynamics and (possibly) emergent narratives arise from player-game interactions. Aesthetics and (possibly) interpreted narratives are formed in the player’s mind; these are affected by dynamics and (possibly) emergent and embedded narratives. Here we use dynamics in a slightly broader sense than Hunicke et al. –to denote all kinds of emergent patterns of player-game interaction. For example, fast moving sprites contribute to twitch gameplay (which tests reaction time), while turn-based mechanics create more strategic gameplay (which tests strategic thinking). We also use mechanics in a broader sense than either Hunicke et al. or Schell –to indicate any game component used to create challenge. For example, if a game uses dark environments not only to create a spooky aesthetic but also to make it more difficult to hit sprites or detect traps, darkness becomes a mechanic. Finally, we use aesthetics in a slightly unusual way, to refer not only to how the game looks and feels (as Schell suggests) but also to the user’s subjective and emotional response to the game (as Hunicke et al. suggest). This choice is based on the observation that when game designers say that artwork reinforces aesthetics, they do not simply mean that artwork reinforces how the game looks (i.e. style); they mean that artwork reinforces how the game feels (i.e. the player’s emotional response). MDTA+N obviously has greater explanatory power than either MDA or the Elemental Tetrad. Lacking technology, MDA is ill-suited to analyze how interface technologies affect player-game interactions, for instance, how using a gamepad versus a mouse and keyboard changes a player’s experience of a first person shooter. Similarly, lacking dynamics, the Elemental Tetrad is not suited to analyze how certain behaviors (e.g. grinding) are created by some mechanics (e.g. fetch quests), mitigated by others (e.g. diminishing experience from repeated actions) or how they affect aesthetics (e.g. more submission, less discovery). Moreover, both MDA and Elemental Tetrad are ill-suited to analyze how game mechanics can cause differences between embedded and interpreted narratives. For example, if the writers are trying to tell a story about a benevolent, honorable hero through cut-scenes while the developers include mechanics for murdering civilians in their sleep and looting their homes, the player’s interpreted narrative is likely to differ from the writer’s embedded narrative. In contrast, MTDA+N, provides the concepts necessary to discuss a wider variety of interactions (e.g. between technology and dynamics) and to unpack system problems in game design including ludo-narrative dissonance –where gameplay and story are in opposition (Hocking 2007). A useful and communicable theory of game design is needed to help game designers and academics speak a common language, to legitimize the study of game design among other social sciences and to educate the next generation of game designers. This essay therefore develops an initial proposal for a working theory of game design. Some important concepts (e.g. bugs, critical reception, level of mature content) are not addressed by MTDA+N. Furthermore, MTDA+N does not attempt to unpack the player (e.g. player types, play personas, play motivations) or player-game interaction (e.g. immersion, flow, mindfulness). Indeed, developing a unified theory of the player is extremely challenging (cf. Canossa 2009) and is best left to future work. Despite its limitations, however, we hope that MTDA+N is useful for teaching fundamentals of game design, clarifies some core concepts (especially the different kinds of game narratives) and provides a unified starting point for future research to refine and extend. Canossa, A. 2009. Play-Persona: Modeling Player Behaviour in Computer Games, PhD Dissertation. Danish Design School of Copenhagen, Denmark. Hocking, C. 2007. “Ludonarrative dissonance in Bioshock” Click Nothing. Online: http://clicknothing.typepad.com/click_nothing/2007/10/ludonarrative-d.html. Hunicke, R., LeBlanc, M., and Zubek, R. 2004. “MDA: A formal approach to game design and game research,” In Proceedings of the Challenges in Games AI Workshop, Nineteenth National Conference on Artificial Intelligence, San Jose, CA. OED. 2013. Oxford English Dictionary, Oxford University Press. Schell, J. 2008. The Art of Game Design, Morgan Kaufmann.